Water pumped into geothermal wells cause microquakes along same fault as Pohang quakeA conclusion has been reached in the debate about whether the 5.4-magnitude earthquake that struck the South Korean city of Pohang in 2017 was a natural phenomenon or man-made through geothermal power generation. The answer came in a report about the correlation between the Pohang earthquake and geothermal power generation released by a government research team on Mar. 20. 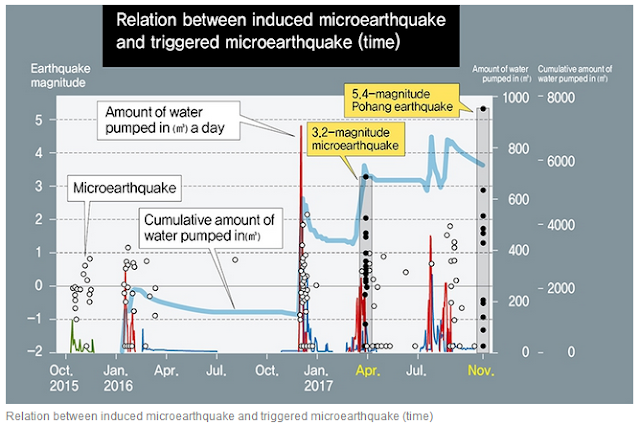 “The process of excavating geothermal wells and pumping water in and out during research for geothermal power generation in Pohang triggered microearthquakes along the fault. As time passed, this ultimately led to the Pohang earthquake,” the researchers concluded. The Pohang earthquake on Nov. 15, 2017, took a human toll, leaving one dead and 117 injured, and also caused 85 billion won (US$75.58 million) in property damage, with some 2,700 buildings affected. After some suggested that an experimental geothermal research facility in Pohang’s Heunghae Township might have been the cause of the earthquake, the government put together a team of foreign and domestic experts in March 2018. The team has been investigating and analyzing the Pohang earthquake since then.